The new Nikon lens-only rebates are now live at Adorama and B&H: you can save up to $200 on selected Nikkor lenses. The rebates are set to expire on November 24th, and it will be part of the Nikon Black Friday Deals 2018. $200 off on AF-S NIKKOR 14-24mm f/2.8G ED: $1,697 at Amazon, B&H, Adorama. $100 off on AF-S NIKKOR 24-70mm f/2.8G: $1,697 at Amazon, B&H, Adorama. $200 off on AF-S NIKKOR 200-500mm f/5.6E ED VR: $1,196.95 at Amazon, B&H, Adorama. $75 off on AF-S NIKKOR 105mm f/2.8G VR Micro IF-ED: $821 at Amazon, B&H, Adorama. $70 off on AF-S NIKKOR 50mm f/1.4G: $376 at Amazon, B&H, Adorama. $40 off on AF-S NIKKOR 85mm f/1.8G: $436.95 at Amazon, B&H, Adorama. $150 off on AF-P DX 10-20mm f/4.5-5.6G VR & AF-S Micro 40mm f/2.8G lenses: $496.95 at Amazon, B&H, Adorama. $100 off on AF-S DX NIKKOR 18-300mm f/3.5-6.3G ED VR: $596.95 at Amazon, B&H, Adorama. $20 off on AF-P DX NIKKOR 10-20mm f/4.5-5.6G VR: $286.95 at Amazon, B&H, Adorama. 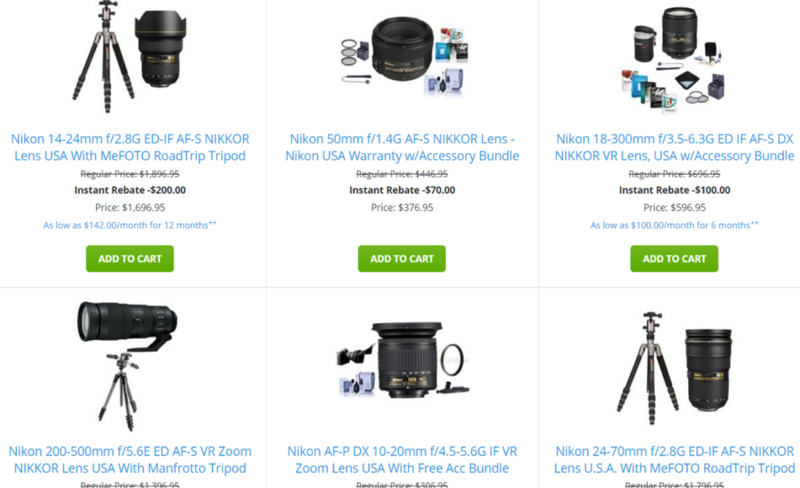 2017 Nikon Black Friday Deals are now Live!